Increasing productivity in the wild is a key focus of Project Godwit – so how did the wild godwits fare in 2017? Black-tailed godwit at the Nene Washes (Mark Whiffin/RSPB). The Nene Washes hold 80-90% of the UK breeding black-tailed godwit population. We found 35 breeding pairs on site in 2017, a decline from 42 pairs in 2016. Our monitoring tells us that there is a strong relationship between breeding success and population change – it will not come as a surprise to most that better breeding success leads to a boost in the population in subsequent years. We know that breeding success has been low for this population over the last couple of years, which probably explains the decline observed in the population this year. Black-tailed godwits are long-lived birds, and most don’t return to breed until they are two years old, so there can be a time-lag before a population change occurs. 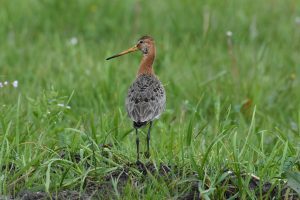 Black-tailed godwit pairs need to successfully fledge one chick every other year in order for the population to sustain itself, or half a chick per pair each year. In the last three years, the number of chicks fledging at the Nene Washes has been below this level, which is a cause for concern. A big focus of Project Godwit will be to boost the breeding success of godwits at the Nene Washes, and increase the number chicks that successfully fledge. In recent years the main driver of poor breeding success at the Nene Washes has been predation, and our research has shown us that different predators have had varying impacts in different years. It’s a complex picture, and one which will require a range of predator management solutions resolve. 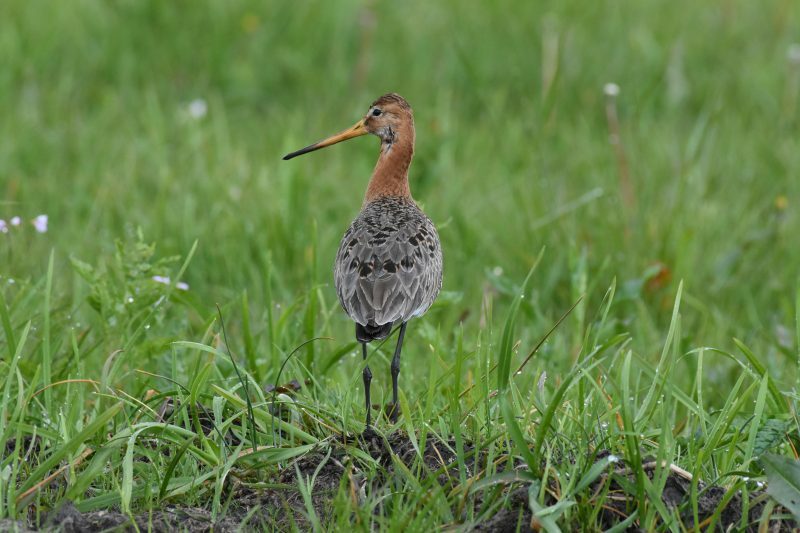 We are monitoring black-tailed godwit nests at the Nene Washes (under a special licence from Natural England). 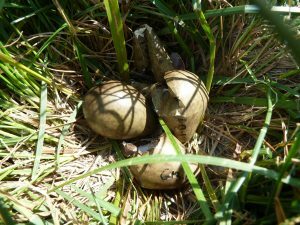 Our monitoring tells us how many nests have hatched and (in most cases) the cause of failure when they don’t. We are also radio-tagging a sample of chicks once they have left the nest. Our approach to predator management is based on the evidence we gather from this extensive research and monitoring programme. One solution we are trialling is the exclusion of ground predators from key breeding areas using temporary electric fencing. 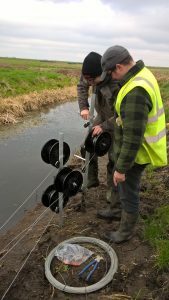 Exclusion fencing has been shown to boost wader productivity at other wet grassland sites but this is the first time this has been tried at the Nene Washes. In 2017 we found that there was a significant boost to nest survival for waders which nested within the boundary of the fencing. However, unfortunately we had a number of godwits nesting outside of the fencing this year, and those nests did not fare so well. We’ll be upping the ante in 2018 – providing exclusion fencing over a larger area. Five chicks fledged successfully at the Nene Washes in 2017, we hope this figure will increase in future years of the project. Tommy and Josh installing the temporary exclusion fencing at the Nene Washes. More good news from Welney! The good news is that the three pairs present at Welney in 2017 successfully fledged two young in 2017. This small population has been very productive in recent years, which bodes very well for the headstarted birds which will hopefully return there to breed in future years. We have released 26 birds through the headstarting programme in 2017. This has provided a huge boost to the number of young godwits in the population this year. If we can match this success with improved wild breeding success at the Nene Washes, alongside the continued successes at WWT Welney, then we should be looking at a much brighter future for our black-tailed godwits.